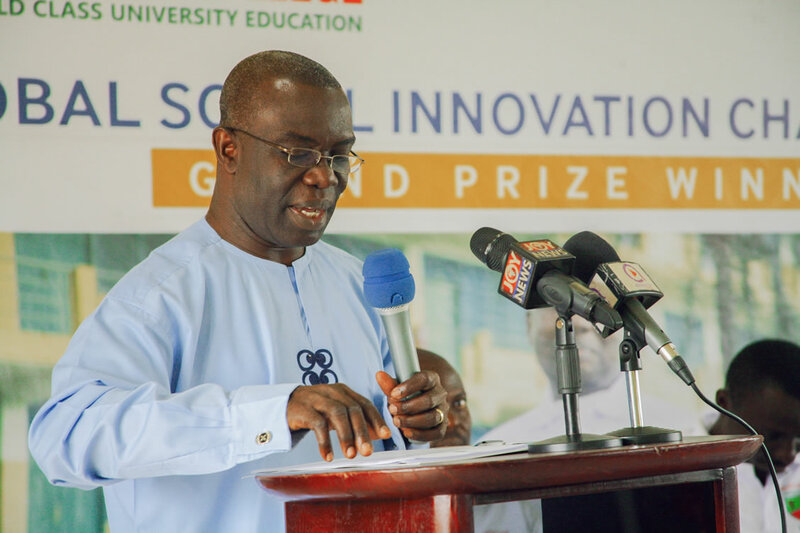 Heritage Christian College (HCC) has held a press conference to announce to the Ghanaian media the global award won by students of Heritage Christian College at the Global Social Innovation Challenge in San Diego USA. The three (3) students turned human excreta into charcoal and won the Grand Prize at the Global Social Innovation Challenge held in USA beating 49 other university teams from six continents. The team, known as Team Charcoal, comprised Evans Kwarkye, Benjamin Nketsia, and Austin Carboo who are all second-year students in the Heritage Christian College’s Business Administration department. The Global Social Innovation Challenge (GSIC), a “social venture pitch competition that recognizes, resources, and rewards student-led social ventures focused on sustainable change,” as its organizers describe it. The GSIC is an initiative of the University of San Diego’s Center for Peace and Commerce. The victory was all the more remarkable, within the Ghana contingent at least, for the fact that it conferred sudden and prestigious validation on an initiative launched by Heritage Christian College in March 2018. The college’s Center for Entrepreneurship, Philanthropy, and Ethics (CEPE)—recognized as a strategic partner of “Team Charcoal”— serves in part as an incubator for ideas hatched by HCC students. Research shows some 80 percent of households on the African continent depend on wood and charcoal as a primary energy source. Charcoal, in its traditional form, is produced from wood. One of the environmental advantages of the Team Charcoal solution is that, because it is made from human waste, their charcoal helps reduce deforestation, which is a problem that’s rampant across the continent. Their charcoal is sanitized for safe handling and it burns clean, thus helping reduce atmospheric emissions. A Mentor of Team Charcoal, Mr. Alexander Ekow Asmah, said the competition was tough with several rounds but Team Charcoal fazed off all the competition from the well-known universities across the world and raced to the very top. The leadership of Heritage Christian College, a university accredited by National Accreditation Board and affiliated to KNUST, is elated with the win, which they feel puts a stamp of authentication on the college’s entrepreneurship-focused directions. The win for Team Charcoal also marked yet another leap for Ghana, and its capital, Accra which in recent years has been recognized as one of Africa’s bright spots for education and innovation. In June, Google announced that they are building an artificial intelligence research center in Accra. It will be Google’s only such center on the African continent.